Most of the written information and criticism of artists of the classical world, not to mention most of their works of art, have been lost. Antigonos of Karystos, a Greek writer in the 3rd century BC. in addition, Duris of Samos another contemporary writer are known to have written about the arts. Today, what little we know of their writings is thanks to a Roman scholar and military man, Pliny the Elder who transcribed Greek sources that were still available in his time. Greek scholars such as Dionysios, a 1st-century BC philosopher had a definite idea of the history of art and a clear sense of how their school of painting had developed from earlier, ancient sources. In the preceding Egyptian school, the artist had considered elegantly created line-drawing to be of primary importance in the composition of their paintings. Within them, the painter applied simple flat colours. Historians in the classical era following Apollodorus, (a 140 B. C. Athenian savant) admired artists like Apelles, the 4th century painter, for their technical skills. When Pliny speaks of Greek artists, his references are mostly anecdotal; he shows his admiration for their invention of chiaroscuro, skill in rendering the ideal female figure and the use of rich full-bodied colours. Many of these ideas have survived the last two and a half thousand years. For example, Pliny asks you to admire those portrait paintings where the subject’s eyes seem to follow you as you move around. Many art lovers being dragged through an art museum today have encountered similar comments by tour guides explaining how some particular portrait on display does the same thing: an example of associating technical skill with artistic quality. 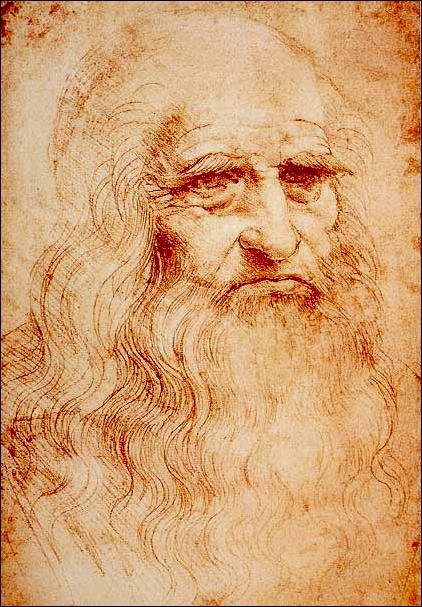 Leonardo da Vinci (1452–1519). Portrait in sanguine (a red-sienna chalk, used very effectively in the French Rococo period). Drawn in 1515, four years before his death, historians consider it a self portrait. However, some scholars feel it may be the image, instead, of a much older man. The paper upon which Leonardo created this drawing is in very fragile condition: it is now stored in a high-security caveau at the Bibliotheca Reale, Turin. Leonardo da Vinci, in his writings, advises the artist short of inspiration when creating a landscape painting to throw a paint-sodden sponge at the surface of his canvas. An artist will discover, hidden in the resulting mess of colours many different landscapes to stimulate his imagination. However, Leonardo had taken possession of a legend first mentioned in Greek classical writings. Again, it is attributed to Apelles. 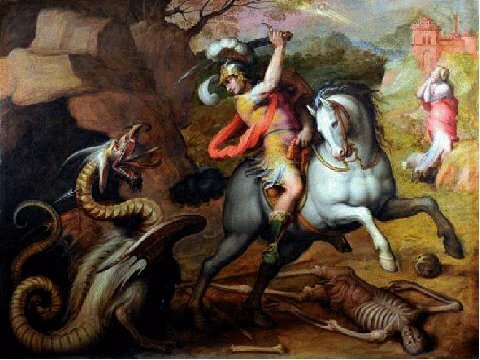 Apparently, during his creation of a battle scene Apelles was unable to paint one of his warhorses foaming at the mouth in a sufficiently realistic manner. In frustration, the artist threw a sponge laden with colour at his painting of the horse’s head and discovered to his delight that the accidental effect obtained was what he had been trying unsuccessfully to achieve. Another skill greatly admired by classical-era historians was an artist’s ability to create three-dimensional illusions in a painting: flowers, fruit more realistic than real such as the painting Apelles created of a bunch of grapes, so authentic birds attempt to eat them. This legend survived over the centuries and resurfaced with Rembrandt van Rijn. The Dutch Master had a reputation as a miser and legend tells how some of his young students, thus inspired, painted a gold coin on the studio floor. The young artists created one so realistic that Rembrandt, when he entered the room, spotted the gold guilder immediately and attempted to pick it up. Giorgio Vasari is recognised as the first professional of art historian. He published his, Lives of the Most Eminent Painters, Sculptors, and Architects in 1550 Florence. A second, enlarged and revised edition appeared in 1568. History accuses Vasari of having, if not actually destroyed the fragments of Leonardo da Vinci’s star-crossed mural painting, Battle of Anghiari in the Salone dei Cinquecento, in Florence’s Palazzo Vecchio, of, at least, having painted over it. In 1557, about sixty years after Leonardo’s death, Vasari, wearing his other hat that of architect, redesigned the hall. Had he overpainted Leonardo’s work with his own fresco he would have had to add a new layer of plaster on top of the original. In order to allow the fresh intonaco to get a grip and adhere to the lower layer of intonaco Vasari would have had to chip numerous small holes in the plaster layer on which Leonardo’s ‘Battle’ was painted: effectively destroying the Leonardo mural beneath. An optimistic theory doing the rounds today is that Vasari, in his great admiration for Leonardo da Vinci and his work and wishing to preserve it from destruction, built a blind wall with the Leonardo entombed beneath. In October 2009 the late Giovanni Festari, owner of the original manuscripts and archives in Vasari’s house in Arezzo attempted to sell them for 150 million Euros to mysterious Russian buyers. Giorgio Vasari’s importance has increased in recent times. He painted in a rather stilted Mannerist style. There, however, have been attempts in recent years to resuscitate Vasari the painter and give him his own small chapter in the history of art as an important Renaissance Tuscan painter. These include an exhibition celebrating the five-hundred anniversary of his birth in Arezzo, at the, Galleria Comunale d'Arte Contemporanea through to 11th. December 2011, and at the Uffizi, Florence. Giorgio Vasari, 1511 – 1574. St. George and the dragon, oil on timber, 240x320 cm. Arezzo, Italy, Chiesa della Badia. Although themselves creative artists, albeit in a different medium, writers often seem incapable of portraying artists as other than buffoons or caricatures, never, seemingly, having encountered one in their lives. When Emile Zola published his roman a clef, L'Oeuvre, in 1886 he used his art as a weapon to wound a close friend, Paul Cézanne, vicariously. They were at school together in Aix-en-Provence and remained friends in the Parisian art milieu. 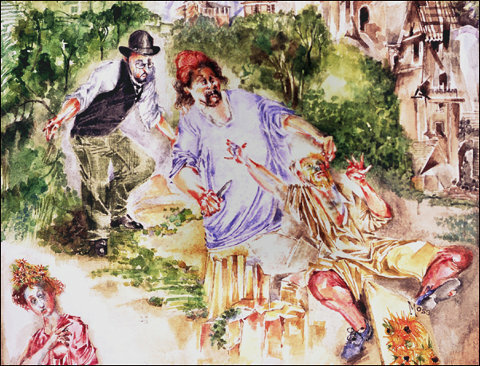 Cezanne took his portrayal as the unsuccessful painter Claude Lantier in Zola’s novel badly. He distanced himself from the novellist after writing to thank Zola in 1886 for sending him a copy of the novel. Robert Hughes the Australian writer on art mentions that, in his thirty years with Time magazine, it was apparent that writing sympathetically about a painter in this widely distributed newspaper did not necessarily boost his career. It gave the lie to the importance that art critics sometimes had of themselves in their ability to make or break an artist. In the seventies and the Early eighties New York art critics honestly believed that they owned artists (artists were, in fact, owned by big-name commercial art galleries). The author, living in Manhattan at the time, was puzzled how Post-war N.Y. art-scene critics Leo Steinberg, Harold Rosenberg, Clement Greenberg seriously believed themselves to be conducting a literary orchestra. In order to acquire legitimacy, artists should follow literary critics’ suggestions as to what subjects and themes were best suited for painting. The art critic as orchestra conductor was encouraged by the emergence at the time of Conceptual art. The artist projected works of art as ideas. The concept, written down on paper, was just as valid as a finished work of art. Language and words were of primary importance in the works of, for example, Ed Ruscha. Paintings were composed of blocks of text; obscure phrases or single words painted onto canvas or simply, applied to the off-white exhibition walls of an art gallery. The febrile art climate of 1970s America played into the hands of a witty and amusingly nasty critic, the essayist Tom Wolfe. In his, The Painted Word published in 1975, Wolfe noted, correctly, that theory now prevailed over practice in the world of art. The idea of putting a work of art together, using traditional or experimental materials smacked too much of William Morris and the 1890s English Arts and Crafts movement. Artists and collectors paid due deference to the often-eccentric theories of art critics who possessed exaggerated egos. Art moved on. Few of these egomaniacal and arrogant judges achieved the longed-for power of their contemporary Dorothy Parker the Broadway drama critic at Vanity Fair and the New Yorker, to be the final arbiters of art or artists. 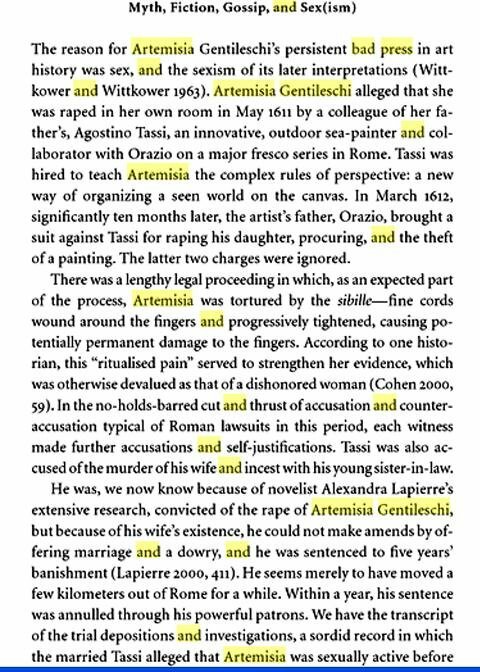 However, even the scholarly Vasari would have accepted the view, held by most painters that the only real damage an art critic can inflict when writing about you is to misspell your name. L'Oeuvre, roman a clef - A novel where the author conceals real persons and actual events as artistic creations. 2. “. . . Unlike literary criticism where the writers own use of words can unleash a counter attack. Giorgio Vasari is an almost unique exception. His importance as an art historian is what attracts critical attention to the quality of his surviving paintings. This is unlikely to occur with art critics who rarely possess artistic skills. “. . . Film producers, even if they mean well, in their ingenuity reserve the most atrocious treatment for the lives of painters and sculptors. A few examples; Artemisia Gentileschi, Michelangelo and every film-directors favourite, Vincent van Gogh. Dorothy Parker 1893 –1967 the Algonquin Round Table in the '60s. Donald Judd, Sol LeWitt, Minimalist artists of 1960s and seventies. 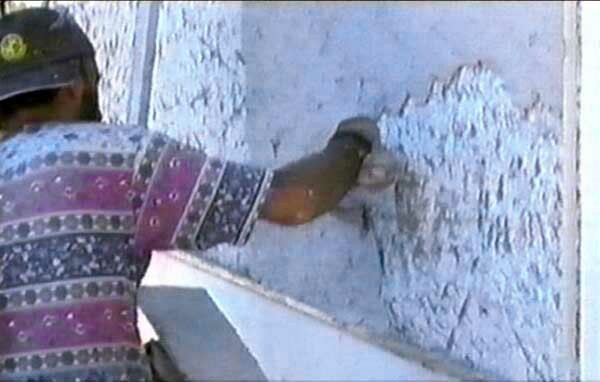 Treatment of lower layer of intonaco to prepare a new, upper layer. Technique Vasari would have used in overpainting of Leonardo’s Battle of Anghiari. ". . . Interestingly, although Picasso attacked him, Matisse admired and befriended him. These days the approval of Matisse goes much further than it used to - it may even count for more than that of Picasso.